SHOW BUSINESS: Back on Broadway for the third time since its 1927 premiere, SHOW BOAT (see cover story) began making history all over again as soon as good word on its return built long lines at the box office. Its first full week following the opening on October 2 saw SHOW BOAT take in $842,636 - the highest single-week box office gross in Broadway history, breaking a record set by MISS SAIGON three years earlier. Over the next three months SHOW BOAT broke its own record repeatedly, and closed out 1994 spectacularly, grossing a record-setting $1,021,211 in the Christmas-to-New Year's Week. Tickets are currently on sale into late summer, 1995. CLIMB EV'RY MOUNTAIN: Since hitting the road in November of '93, the new national tour of THE SOUND OF MUSIC starring Marie Osmond, directed by James Hammerstein, has travelled to 62 cities in 35 states. Now in its second year, the tour is slated to visit nearly two dozen more cities, including Portland, Vancouver, Salt Lake City, Denver, Tucson, Cincinnati and Pittsburgh. Although THE SOUND OF MUSIC will come off the road later this spring, talks are underway for Marie & Co. to continue their climb in the fall. NOW PLAYING AT A THEATRE NEAR YOU: THE SOUND OF MUSIC will not be alone on the R&H Road this year...In June, Phyllis Diller puts her uniquely wicked spin on CINDERELLA's step-mother in a summer tour that director Paul Blake will launch at his own St. Louis MUNY... The Theatre Guild's tour of STATE FAIR kicks off (appropriately) in Des Moines during the Iowa State Fair in August; more in our next issue on this new stage version of Rodgers & Hammerstein's only musical written for Hollywood...Discussions are currently underway for a National Tour of CAROUSEL, based on the recent Tony-winning Broadway production and scheduled to begin its year-long trek of the U.S. and Canada in early 1996. As CAROUSEL heads out, THE KING AND I is coming in, as the Christopher Renshaw-directed version starring Hayley Mills plays the road in late summer before arriving on Broadway in the fall...Traffic is just as hectic across the Atlantic where OKLAHOMA! and CARMEN JONES are touring the British Isles simultaneously. CONCERTED EFFORTS: "Musicals in Mufti," a concert series presented by the acclaimed York Theatre Company of New York, will feature three performances of DO I HEAR A WALTZ?, the Rodgers/Sondheim/Laurents musical, in late May; casting and director to be announced... Meanwhile, as part of the New York City Center's second season of "Encores! 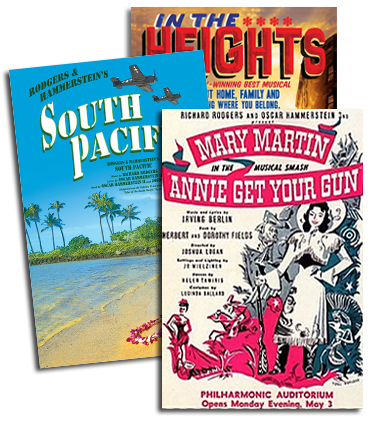 Great American Musicals in Concert," series artistic director Walter Bobbie and musical director Rob Fisher have put together a season that includes Irving Berlin's CALL ME MADAM (directed by Charles Repole) for four performances beginning February 16, and Rodgers & Hart's PAL JOEY (directed by Rob Marshall) for four performances during Hart's centennial week, May 4-6. I COULD WRITE A BOOK: Richard Rodgers' autobiography, Musical Stages, first published by Random House in 1975, in paperback by Jove in 1978, and out of print for more than a decade, will be republished by Da Capo Press of New York this spring. The trade paperback edition, with a new introduction by Mary Rodgers, will be published in April....As a successor to Noel & Cole, his contrasting study of the lyrics of Noel Coward and Cole Porter, Stephen Citron has written The Wordsmiths: Oscar Hammerstein II & Alan Jay Lerner, to be published this spring by Oxford University Press in the U.S., and Sinclair-Stevenson in the U.K...Cited by Newsweek as "a literate and moving account," Mary Ellin Barrett's portrait of her father, Irving Berlin: A Daughter's Memoir (see HAPPY TALK, Vol. II, No. 1), is currently available in bookstores nationwide. MUSIC BOX MUSIC BOX: To commemorate the dedication of an Irving Berlin plaque and exhibit at the Music Box Theatre (see story, page 5), a special "Music Box" music box has been created by the esteemed London firm of Halcyon Days. Inspired by art from the original 1921 theatre program and playing the anthem of the revues, "Say It With Music," the music box retails for 175 and joins several other Halcyon Days musical collectibles inspired by songs from our catalogues, including "Oh, What a Beautiful Mornin'," "White Christmas" and "Always". For further information call Halcyon Days in London at 0114471-629-8811 or fax 0114471-409-7901. SIXTEEN GOING ON THIRTY: In anticipation this spring of the 30th Anniversary of THE SOUND OF MUSIC, still ranked as the most popular movie musical ever made, Fox LaserDisc, a division of FoxVideo, has released a special commemorative edition of the movie on laser disc. Retailing for $119.98, this special boxed set features a newly mastered widescreen transfer of the entire two hour, 54 minute movie supervised by Academy Award winning director Robert Wise, who also provides an alternate audio track running commentary during the film. Also included in the boxed set: a 1965 television featurette on the shooting of the film in Salzburg; the original theatrical previews and TV ads; interactive stills archives; an audio interview with screenwriter Ernest Lehman; a new 90-minute documentary on the making of the movie with Julie Andrews, Christopher Plummer, members of the von Trapp family, James Hammerstein and Ted Chapin of this organization, and others; and a 24K gold CD of the original motion picture soundtrack...Other SOUND OF MUSIC 30th Anniversary commemoratives to be detailed in our next issue, but in the meantime look out for a special expanded television broadcast of the film, set for Sunday night April 9 on NBC. HEART TO HART: Ivy Austin will perform a special one-hour tribute to Lorenz Hart on National Public Radio, recorded live at NPR's studios in Washington D.C., and broadcast on Valentine's Day (check local listings for time). HER FUNNY VALENTINE will include standards as well as lesser-known gems, and is being written by Isaiah Sheffer, who will serve as co-host with Miss Austin; musical director Rob Fisher will lead members of the Coffee Club Orchestra...In April Mary Cleere Haran will premiere her tribute to Lorenz Hart at Rainbow & Stars in New York, concurrent with the Varse Sarabande release of her new album, THIS FUNNY WORLD: LYRICS BY HART. OSCAR WINNER: In March GREAT PERFORMANCES will broadcast a centennial tribute to Oscar Hammerstein II nationally on PBS. Combining documentary footage and stills with numbers from a Hammerstein concert taped at New York's City Center in January, the tribute will feature performances by Julie Andrews, Willie Nelson, Patti La Belle, Mandy Patinkin, Vanessa Williams, Peabo Bryson, Bernadette Peters and others. Also making special appearances: Harold Prince and Stephen Sondheim. Check local listings for further information. LINDY HOP: R&H Music signee Lindy Robbins is keeping busy as renditions of her songs take off from coast to coast. In January two of her songs (with music by Gerald Sternbach) were featured in a new revue, GAY '90s, in Los Angeles...Billy Stritch is currently performing a new song he's written with Lindy, "Come Hither"... Harvey Fierstein features "The Final Song" (music by Ann Hampton Callaway) in concert appearances around the country...Petula Clark has "Strangers Once Again" (music by John Buchino) in her current concert tour, and Andrea Marcovicci's cover of "Strangers..." appears on her newest album, NEW WORDS (Cabaret Records)...and no less than four new Robbins/Sternbach numbers will be featured as lavish production sequences in the all new 1995-96 Red Unit edition of The Ringling Bros. and Barnum & Bailey Circus, kicking off at New York's Madison Square Garden in March. HEAVEN ON EARTH: ONLY HEAVEN, Williamson composer Ricky Ian Gordon's new theatre piece, sets 27 Langston Hughes poems to music and will be staged in New York this spring by Encompass Music Theatre, directed by Nancy Rhodes; with musical direction by Jack Gaughan; performances at the Theatre Row Theatre run from March 30 through April 9. Call (212) 594-7880 for further information...Gordon ended 1994 on a high note - literally, when he accompanied Angelina Raux in a recital of his works (and others) at Merkin Concert Hall on New Year's Eve...Upcoming in 1995 are two Williamson Music songbook publications: A HORSE WITH WINGS: SONGS OF RICKY IAN GORDON, and GENIUS CHILD, Gordon's song cycle based on Langston Hughes poetry and premiered by Harolyn Blackwell on her RCA Victor album STRANGE HURT last year.